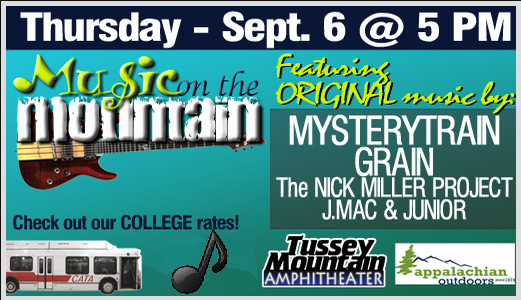 Tussey Mountain Amphitheater is holding its first ever Music on the Mountain concert on Sept. 6, 2012 starting at 5:00 PM! It will be featuring local talents such as Mysterytrain, Grain, J.Mac & Junior, and The Nick Miller Project ft. Gabe Green! It’s $15 for students to get in with their PSU ID, $10 for senior citizens, and children 12 & under are FREE! There will be optional chairlift rides with beautiful scenery that take you up to the mountain for only $5 a ride, and you are welcome to bring glowsticks, lawn chairs, hula hoops and anything else you see fit to make your concert experience more enjoyable. 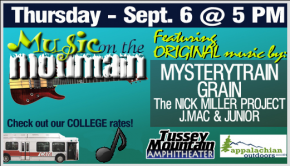 Come out to Tussey and support our local bands!